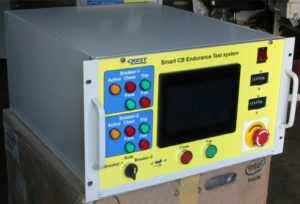 Vacuum Interrupter Bottle Test System – Crest Test Systems Pvt. Ltd. 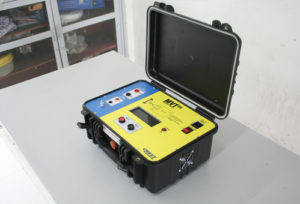 The Vacuum Interrupter Bottle Test System is a powerful PLC-controlled digital contact resistance meter consisting of a touchscreen display and a built-in continuous DC source of up to 200 A. 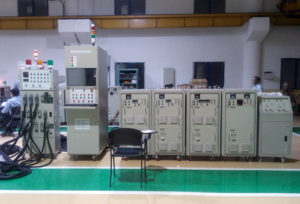 The test system has the ability to apply force of a precise value up to 500 kgf on the ends of the vacuum interrupter bottle through a servo control feedback system. A load cell is used for accurately measuring the applied force. 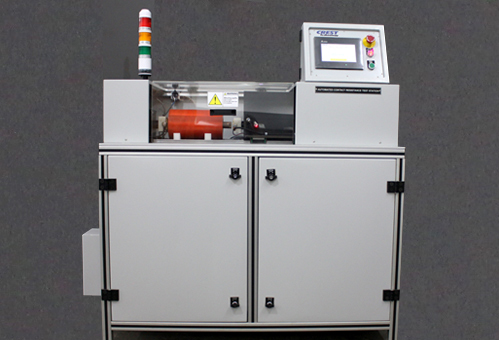 The Vacuum Interrupter Bottle Test System has a custom-designed, heavy-duty mechanical test fixture. 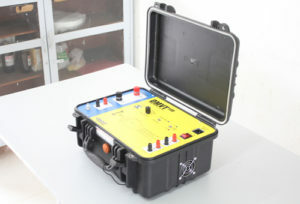 The test fixture is suitable for loading interrupters of different types and sizes. The system has a proprietary test software. You can enter the test parameters for force applied, current, and resistance limits in the software. The software shows the values of the actual force applied, actual current flowing, and obtained resistance values along with pass/fail indication. The instrument is isolated from the effect of electrostatic and electromagnetic field by bypassing the induced charges to earth. There are number of safety interlocks that prevent inadvertent operation of the system, and also ensure safety of the DUT and the operator.